Holy winter did we get snow last week. The fifteen or so inches that fell isn’t a particularly unusual accumulation for the Lake Superior snow belt, but it was a wee bit early. I think we can all agree on that. The storm caught almost all of us off guard. Climate change is so unsettling, isn’t it? Needless to say, it took almost twenty four hours for me to remember my bees. My bees! The electric fencer is still plugged in and is now shorting out! 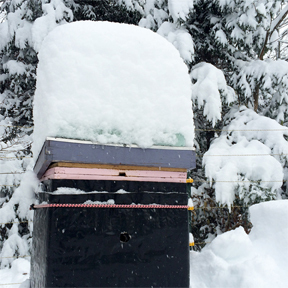 The bottom air vents on the hives are buried in snow! My bees need me! Clearly I was going to be late for work. That’s the thing about winter that I always forget. Everything takes LONGER. Getting dressed takes longer – stripy tight season, long underwear, and multiple layers. Getting out the door takes longer – which coat, what scarf, and where’s my hat? Warming up (please start) and scrapping the car takes longer. And the commute. The commute is a lesson in patience that takes F-O-R-E-V-E-R. Eventually this all becomes second nature. But the first week is brutal. I did make a detour to the bee yard on my way to work, but I was frazzled by the time I got there. I donned my snow pants (more layers, yea! ), grabbed my green shovel, and tromped through the snow to unplug the electric fence. I scraped out around the hives and snuggled up close to have a listen inside. The moment I heard their low, sweet buzz, I sank down in the snow and sighed. It gets me every time. Suddenly I wasn’t late for work. 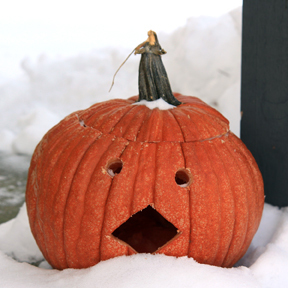 I wasn’t ticked offed by winter’s early onset. And I didn’t care that my entire left sock was half way down my heel. I was just with my bees. It was that simple. Eventually I pulled myself away and landed back in the reality of Wednesday. But for a good minute or two I was in a state of undiluted joy. Which may not sound like much, but I’ll take it. Those two minutes carried me through the rest of a very long week, thank you. As luck would have it, I also have a stack of honey comb in the pantry to help carry me though the brunt of winter. There’s plenty of extracted liquid honey too, which is nice for cooking and baking, but for almost any other use, I reach for comb honey. It’s like regular honey, only supercharged with texture and flavor. And it’s laced with enzymes and pollen to boot. Comb honey used to be the honey of choice among consumers because it was guaranteed 100 percent honey with no additives. But once bottled honey became a regulated commodity in the early 1900’s, comb honey gradually fell out of fashion. It’s slowly becoming trendy, but even so, a lot of people just aren’t sure what to do with it. And I don’t blame them. Because really, you’re asking them to eat wax. Nowhere in the food pyramid does wax appear. I initiate people by suggesting they dip a knife into the comb honey and spread a thin layer onto warm buttered toast. This comes with the caveat that doing so could lead to an excessive desire for toast and honey. Which really, in the scheme of things, isn’t so bad. Is it? 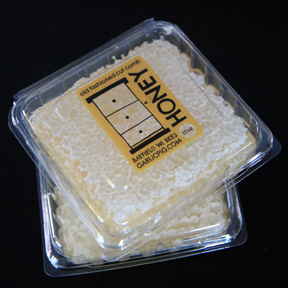 Comb honey is also melts deliciously into oatmeal and hot cereals. I like it in my tea too – most of the comb dissolves, but there are usually a few mini honey rafts floating about that I quite enjoy. It’s terrific sliced thin and served with cheese and fruit (blue cheese and crisp pears are a favorite). Very dark, bitter chocolate and a dab of comb honey is a duo to write home about. And it’s an unbeatable, natural sweet pick me up when eaten straight by the spoonful – chewy and soothing. I use comb honey liberally in the kitchen. I like to experiment and see what it does to flavors. My only rules are to slice it thin and use it sparingly. I want it to complement, not overshadow. 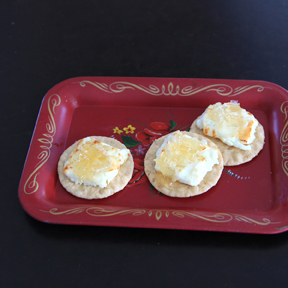 When I needed a fast appetizer a few months ago, I stuck some feta cheese under the broiler for a few minutes, opened a box of rice crackers and assembled little baked feta honey bites. It was so easy and good that I’ve repeated it a half dozen times since. It’s got that sweet, salty, savory mix that I love. Winter may have come earlier than expected, but its chilly winds bring a welcomed kick in the pants to get back in the kitchen and play. Eat well and keep cozy! P.S. The bees had a marvelous summer and I do have extra comb honey and bottled honey for sale. Comb honey is tricky to ship, but if you live in the Chequamegon Bay Area, I deliver! More info here. 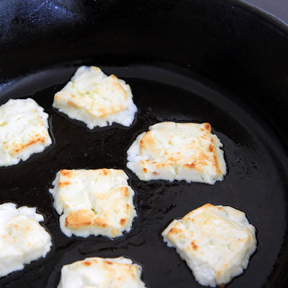 These are dynamite served while the feta is still warm, but they are mighty fine at room temperature too. Slice the feta into pieces about 3/8” thick. Place on a lightly oiled baking sheet or cast iron skillet. Drizzle very lightly with olive oil. Broil the cheese until it is just beginning to turn golden brown on top, about 5 minutes, depending on your broiler. Watch it closely! It will get a little bit melty, but once it cools it holds it’s shape nicely. Remove from oven and let cool a few minutes. When it is firm enough to handle, use a spatula or knife to transfer cheese pieces to individual crackers. Top each with a thin slice of comb honey. I wish I lived closer! I’d love some of your comb honey. Jill really enjoy your blog. And i love to visit with yr mom, she has been such an incredible support for me. Living in the south, i do miss the winter, believe it or not. Thank you so much Frieda, and apologies for my extremely tardy reply! I know my mom loves your visits. Glad the two of you were able to reconnect. Nice to hear from you Jill. I’d love to purchase some honey for us and some for gifts. Will you be coming to Mary’s for Thanksgiving by chance?